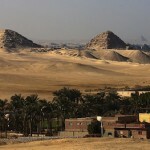 The mission of the Czech Institute of Egyptology, Faculty of Arts, Charles University in Prague has recently made an unexpected discovery at Abusir South that once again highlights the importance of this cemetery of the Old Kingdom officials. Work commenced in 2009 on a large mastaba termed AS 54, followed by several seasons of excavations. Its exceptional size (52.60 x 23.80 m), orientation, architectural details, as well as the name of king Huni (Third Dynasty,) discovered on one of the stone bowls buried in the northern underground chamber, indicate the high social standing of the person buried in the main (so far unlocated) shaft. Unfortunately, his name remains unknown due to the bad state of preservation of the cruciform chapel. 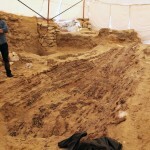 Clearing the area south of Mastaba AS 54 revealed an 18 m-long wooden boat during the 2015 excavation season. It was lying on tafla, covered with the wind-blown sand. Although the boat is situated almost 12 m south of Mastaba AS 54, its orientation, length, and the pottery collected from its interior, make a clear connection between the structure and the vessel, both dating to the very end of the Third or beginning of the Fourth Dynasty, ca 2550 BC. While extremely fragile, the roughly 4,500 year old planks will shed new light on ship building in ancient Egypt. The wooden planks were joined by wooden pegs that are still visible in their original position. Extraordinarily, the desert sand has preserved the plant fiber battens which covered the planking seams. Some of the ropes that bound the boat together are also still in their original position with all their details intact, which is a unique discovery in the study of ancient Egyptian boats. All these minute details are of the highest importance, since most of the ancient Egyptian boats and ships have survived either in poor state of preservation, or were dismantled in pieces. During the 2016 season, the Czech Institute of Egyptology will launch a project, together with experts from the Institute of Nautical Archaeology (INA) at Texas A&M University, to study the techniques used in the hull’s construction. Scholars debate the purpose of Egyptian boat burials. Did they serve the deceased in the afterlife, or might they have functioned as symbolical solar barques, used during the journey of the owner through the underworld. The Old Kingdom kings adopted the earlier tradition, and often had several boats buried within their pyramid complexes. Unfortunately, most of the pits have been found already empty of any timber, others contained little more than brown dust in the shape of the original boat. The only exception were the two boats of Khufu that have survived, and were reconstructed or are in the process of reconstruction. However, there was no boat of such dimensions from the Old Kingdom found in a non-royal context, until the new discovery at Abusir. “It is by all means a remarkable discovery. The careful excavation and recording of the Abusir boat will make a considerable contribution to our understanding of ancient Egyptian watercraft and their place in funerary cult. And where there is one boat, there very well may be more.” adds director of the excavations, Miroslav Bárta. The boat by the southern wall of Mastaba AS 54 indicates the extraordinary social position of the owner of the tomb. Since it is not located adjacent to a royal pyramid, the owner of the mastaba was probably not a member of the royal family: both the size of the tomb, as well as the presence of the boat itself, however, clearly places the deceased within the elite of his time with strong connections to the reigning pharaoh. Doc. PhDr. Břetislav Vachala, CSc.